#1: "Start backup in every: 6 hours AND when idle for at least 5 minutes"
Backups won’t be more frequent than 6 hours. 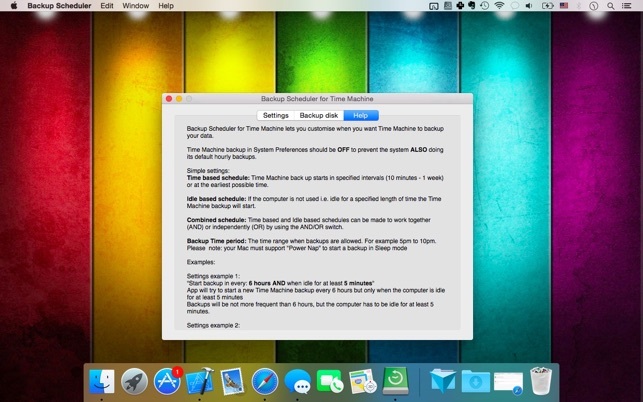 #2: "Start backup in every: 6 hours OR when idle for at least 5 minutes"
Backups could be more frequent than 6 hours. #3: "Start backup in every: never and/or when idle for at least 10 minutes"
App only tries to start a backup when computer is idle for at least 10 minutes. #4: "Start backup in every: 1 day and/or when idle for at least never"
App tries to start a backup every 24 hours whether or not computer is idle. App tries to start a backup every 24 hours between 5pm and 10pm if computer is idle for at least 3 minutes. Note: In Sleep mode computer can only start backups if “Power Nap” is supported otherwise conditions can only be checked when computer is running. 1. Do I need to disable Time Machine backup? This is recommended but not necessary. If it is Turned On the system will continue to start a backup according to its 1 hourly schedule as well as starting a backup based on your own preferences. 2. Where can I set up a new Time Machine disk? 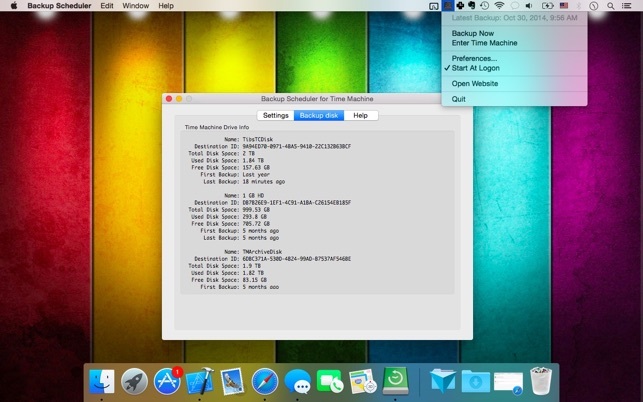 All settings are still handled in System Preferences / Time Machine. This app only instructs the system when to start a backup. 3. 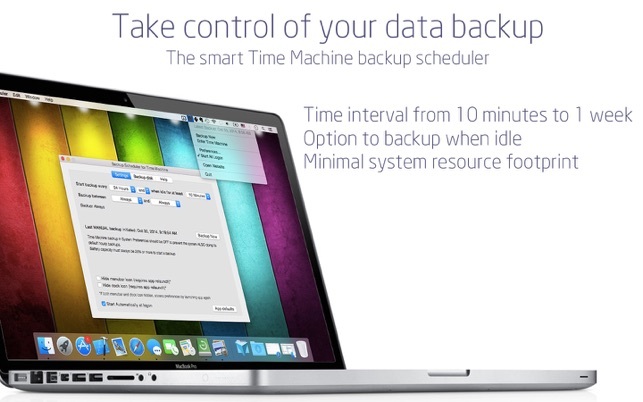 How does Time Machine Scheduler work? It simply tells the Time Machine app to start a backup based on the app schedule that you set in the preferences. This is done automatically if Helper is installed, otherwise it displays a reminder. 4. Where can I see the backup progress? If Helper script is installed the app automatically shows the backup progress, last successful backup date, time and drive info. If the script is not installed this information can be found in the Time Machine app. 5. How to access the app preferences if both Dock and menubar icons are disabled? Relaunch the app from the Applications folder or LaunchPad. It will open the app preferences window automatically. YES, our free Helper script (available from our website) is recommended for optimal user experience. Macht was es soll, Leider nicht auf Deutsch! Das Programm macht was es soll. Leider gibt es das Programm nicht auf Deutsch. Eigentlich wollte ich keine Programme mehr kaufen, die nicht auch auf Deutsch sind. Hier nun die erste Ausnahme! Wenn es eine deutsche Version gibt, gibt es auch 5 Sterne! Frei einstellbare Intervalle, übersichtliche Menüs, alles funktioniert…… was will man mehr. Eine deutsche Variante wäre vielleicht mal nicht schlecht. Funktioniert wie beschrieben. Man muß lediglich die Funktion automatische Backups deaktivieren, ansonsten wird von TimeMaschine weiter stündlich gesichert.